Advantages of the technological scheme of the passive heat sink during the organization of the downward motion of the coolant in the core of the research reactor using natural circulation are shown. 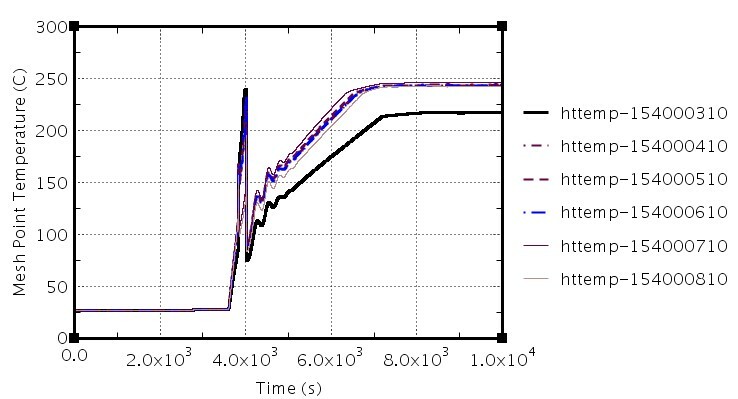 Examples of a numerical evaluation of the hydraulic characteristic of a cooling circuit based on the principle of natural circulation are given and the possibility of using such a scheme for medium-capacity research reactors is justified. The issues of the increasing of the power level while start-upp of such reactors, as well as the issues of increasing the safety of research reactors, are considered. The main task of research reactors is to provide a source of neutrons for research and other purposes, and the process of their producing in the form of beams can be different depending on the purposes. The range of tasks that are set before these installations is wide, including analysis and testing of materials, production of radioisotopes. Among the applications are nuclear power, nuclear fusion researches, environmental studies, the development of new materials, the development of drugs and nuclear medicine . As a rule, in such reactors circuits with forced cooling of the reactor core by the coolant pumped by pumps are used, but low-power reactors sometimes use a circuit with natural circulation of the heat carrier, for example, in the reactor IR-100 (Sevastopol, Crimea). Despite the advantages of the passive principle of reactor core cooling, it is practically not used because of the disadvantages of the circuits with lifting motion of the coolant in the core. Moreover, these schemes of heat removal from the reactor can not be called completely passive, since a secondary circuit with forced movement of the coolant is used. To overcome these disadvantages, a passive cooling system with a downward coolant movement in the core of the reactor is proposed, the advantages of which will be discussed below. Passive operation of systems is one of the key conditions for high reliability and operational safety. There is nothing that could disable or damage the mechanism of gravity, so the operation of systems on this principle is absolutely reliable. One of the applications of gravity are the systems of natural circulation, based on the difference in pressure of the hydrostatic column of liquid in the circulation circuit due to the temperature gradient and, correspondingly, the coolant density. An important advantage of research reactors with natural circulation is that it is possible to reduce the volume of safety requirements with respect to them, but only taking into account their self-protection properties and on the basis of specific safety justification documents presented by their owners for independent examination. When using the adopted natural circulation schemes with the lifting motion of the coolant in the fuel assembly, it is very difficult to determine the thermal power of the reactor by measuring the mass flowrate and raising the temperature in the core, which can be attributed to the disadvantages of such cooling circuits. 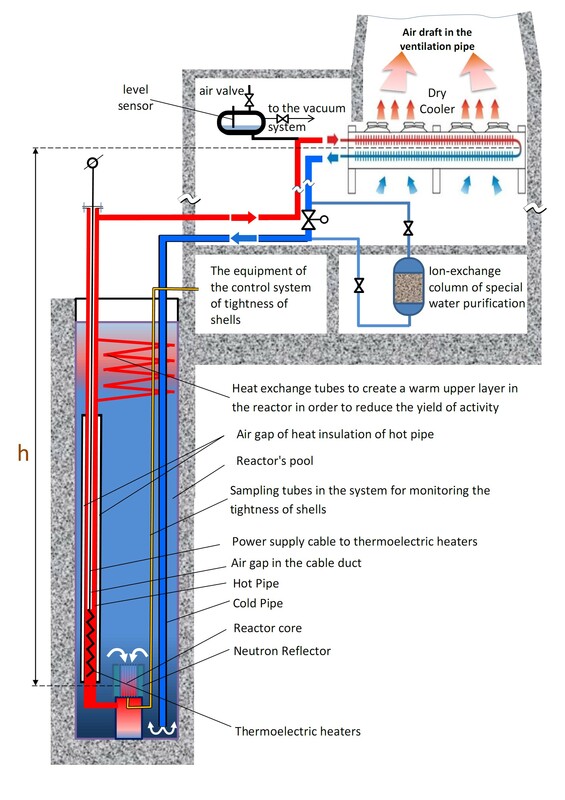 To eliminate this disadvantage and increase the intensity of heat removal, it is proposed to organize a natural circulation loop with the descending flow of the coolant through the fuel assembly for research reactors of the pool-type, as shown in Fig. 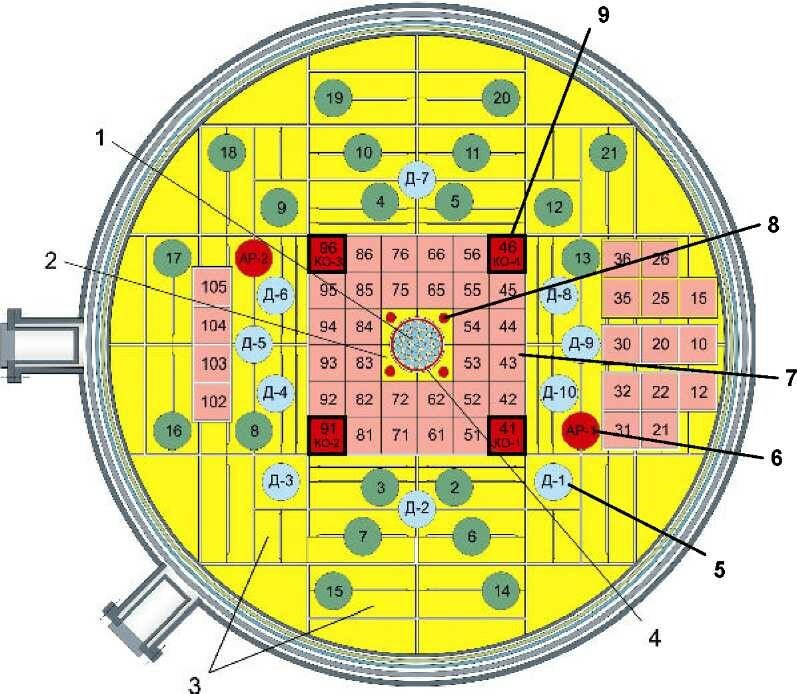 1, but for a research reactor of the vessel-type, as shown in Fig. 2. The use of such a technological scheme will allow the standard instruments to measure accurately both the coolant flowrate through the reactor core and the heating of the coolant in it, and, consequently, to control the thermal power. - A water purification system using ion-exchange columns in pool-type reactors can operate in a passive mode (without a pump), since the coolant is cooled to a sufficiently low temperature (below 50 °C), and the pressure difference on the coolant circulation column can be created by pressure drop on the control valve. However, if necessary, forced circulation of the heat transfer medium through the ion exchange columns can be made by a pump, which will allow to purify water in a stopped reactor. The calculated temperatures for the heating of the coolant in the core of the reactor in the pool type range from 5 to 40 ° C, the average water temperature in the reactor is from 30°C to 40 °C with a heat output of 50 to 2000 kW at an effective circulating circuit height of 8 to 17 meters. It should be noted that for operation at high reactor power, it is required to provide a developed heat exchange surface for dry cooling towers and to ensure efficient natural convection of air in the heat exchangers because of the relatively low average log temperature difference between hot water and cooling air. 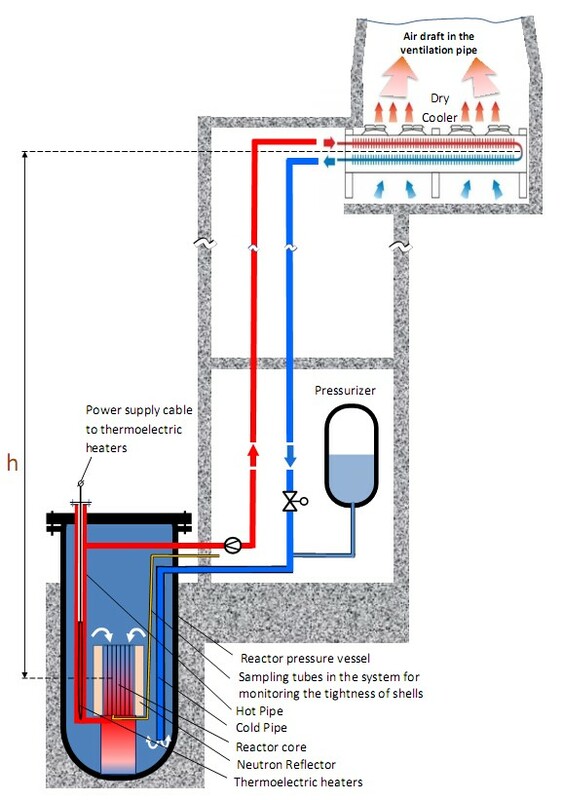 Limitations of the height of the circuit, and of the intensity of the natural circulation of the coolant inherent in the pool-type reactors, are eliminated when using the vessel-type reactor at elevated pressure (Figure 2). The high temperature of the coolant in the circulation circuit ensures an increase in the efficiency of heat removal in dry cooling towers while maintaining the heat dissipation area in these heat exchangers. In addition, a large air heating creates a high driving force of natural convection in the ventilation pipe, which also increases the efficiency of dry cooling towers without electric fans. Thus, such a heat sink system can ensure the operation of the research reactor at a sufficiently high power with a completely passive cooling system. Preheating system for the ascending section of the natural circulation circuit. For pool-type reactors, the main element of the first system is a vacuum tank with a level gauge connected to the upper point of the circulation loop. Vacuuming of this tank allows filling with coolant from the reactor tank all pipelines and dry cooling towers, while full filling is controlled by the appearance of water in this tank, from using a level gauge or a level sensor. For the tank-type reactors, the filling of the coolant circulation circuit is carried out from the system under pressure. After the pipelines are fully filled with water, the heating section of the pipeline begins to heat up by tubular electric heaters located in the lower part of the riser, while the control valve on the cold line is closed. After warming up the lifting area, the control valves are opened and, in the presence of fans on dry cooling towers, they are put into operation. In the absence of fans, natural convection of cooling air develops due to draft in the ventilation pipe. This scheme of fully passive heat sink is preferable for vessel-type reactors at a high temperature of the coolant in the circulation circuit of the reactor. After the development of natural water circulation due to the initial heating of the coolant by tubular electric heaters, the operator raises the thermal power of the reactor core to the required level by the regulating bodies. When the reactor is brought to a predetermined power level, tubular electric heaters, whose energy release is approximately 1-10% of the reactor power level, are turned off. After this, the regulation of the circulation and heating of the coolant in the reactor core is controlled by the operator by opening or closing the control valve. The calculations of the dynamics of the reactor power output using RELAP5 confirmed the efficiency of this procedure with the disconnection of the tubular electric heating elements. As an example, calculation of the dynamics of output to the nominal power level of 10 MW of the reactor with natural circulation is given, a simplified nodalization diagram of which is shown in Fig. 3. The core of the reactor is similar to the core of the research reactor SM-3, Fig. 4 . The reactor specifications are given in Table 1. Raising the capacity of a research nuclear reactor with natural circulation to the required level is performed with fully open valves, which always remain open. At the first stage, electric heaters with a capacity of 100 kW at the bottom of the pipeline lifting section are turned on, which operate for 2 hours, and then are switched off. After one hour of operation of the electric heaters, the reactor power is gradually increased from zero level to 10 MW for 1 hour. Below is the dynamics of the change in the thermohydraulic parameters of the reactor in the initial stage of the reactor operation. 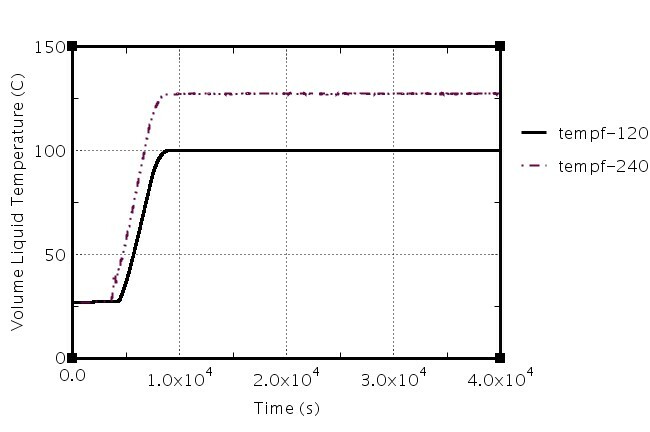 Figure 5 shows the change in the average coolant temperature above the core (BR-120) and at the outlet from the core (BR-240). When the power of the fuel assemblies is increased and the natural circulation is not sufficiently developed, a short-term peak in the temperature of the maximum heat-stressed fuel element occurs (Fig. 6). The velocities of the coolant in the fuel assemblies of the reactor core are practically the same and do not depend on their power (Fig. 7). Thus, the use of electric heaters in the lifting section of the pipeline of the natural circulation loop provides a descending movement of the coolant in the reactor core when it reaches a high level of thermal power. The shutdown of the reactor installation is carried out either by the control devices or emergency protection system. After shutdown the reactor, if there are fans in dry cooling towers, they are also switched off. The low level of residual energy release in the reactor core does not imply any additional measures to remove residual heat from the fuel assembly, except of the natural circulation. Drainage of water (coolant) from the circulation loop of the pool-type reactor after its shutdown is effectuated by opening the air valve on a low-pressure vessel, which leads to the connection of this vessel to the atmosphere and drainage of water from the circulation pipelines into the reactor vessel under the gravity force. Due to the simplicity of the technological scheme, the number of accidental situations with a possible worsening of heat removal from the reactor core is severely restricted. For pool-type reactors, the circulation pipe may break or unintentionally close the valves on the pipeline of the circulation loop. For reactors of the vessel-type, an accidental situation may occur with the failure of the safety valve when the pressure rises or the situation with a sharp decrease in pressure due to the depressurization of the pipeline. When the reactor is operating at the nominal power level, a decrease in the flow rate of the coolant at the outlet from the reactor core below the set value leads to the operation of the emergency protection and the reactor stops. The same happens with increasing or decreasing pressure in the vessel-type reactor. In all these cases, the operation of the emergency protection system takes the reactor into a safe state. 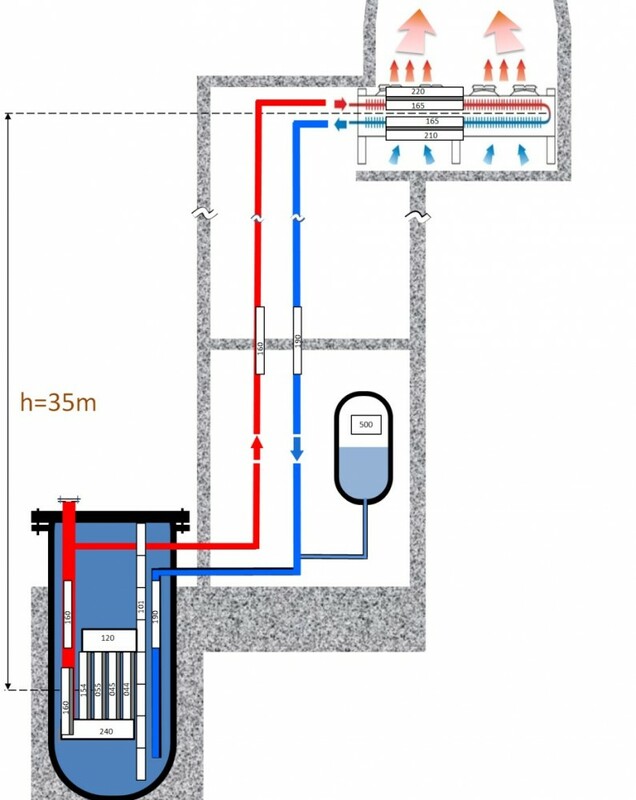 Measures that need to be taken to reduce the negative radioactive impact during the depressurization of the circulation loop: pallets with leakage sensors and free draining of the coolant into the collecting tank for liquid radioactive waste should be installed in all the rooms where the circulation pipelines pass. Depressurization of the fuel assembly is identified by the system for checking the leaktightness of the gains, the reactor is shutdown manually by personnel or automatically and the defective fuel assembly is unloaded from the reactor. Reactivity accidents with passive acting absorbing devices should be considered for specific cases of reactor core. For research reactors, it is possible to abandon forced circulation systems in favor of systems with natural circulation, which increases the stability of the reactor core cooling system and the safety of the reactor installation as a whole. Even a complete loss of electricity does not affect the intensity of the heat removal from the core of the reactor. The parameters of the reactor installation with the capacity of 10 MW and thermal neutron flux density 5×1014 neutrons/cm-2×s-1 with natural circulation of the heat carrier are given. 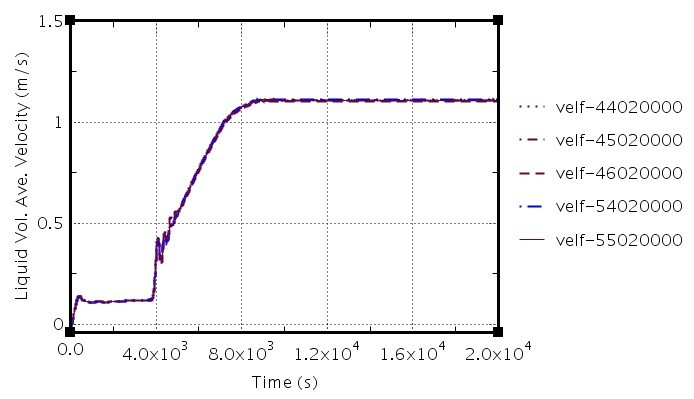 After carrying out thermohydraulic calculations using RELAP5, it is shown that it is possible to ensure a downward movement of the coolant in the core of such a reactor using electric heaters in the lifting section of the circulation pipeline in the starting mode. Absence of complicated electromechanical equipment with their duplication will allow to significantly reduce the cost of reactor installations and reduce the requirements for maintenance personnel. Bat G.A., Kochenov A.S., Kabanov L.P., Research nuclear reactors. Textbook for high schools, Moscow, Atomizdat, 1972.